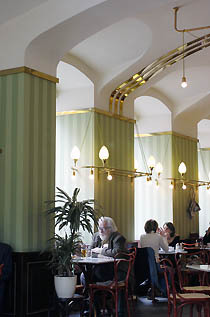 Loos created this simple, unadorned Viennese coffee house in the peak of the Art Nouveau period, very close in both space and time to the exuberant Secession Buiding. 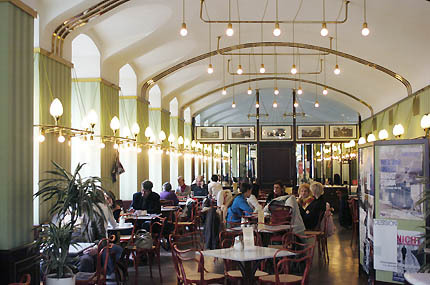 The café was nicknamed "Café Nihilism". 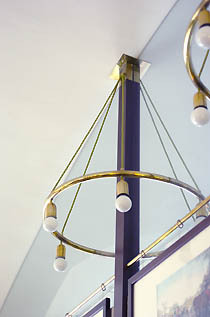 Heinrich Kulka, Loos' pupil, described it as "the starting point for all modern interior design." The color scheme of the café is anything but nihilist: light green walls contrasting with red bentwood chairs (which Loos designed), and bright brass rails. The lights are mostly bare bulbs hung by their electric cables, but spaced out by brass rails to give a strong visual effect without overt ornamentation. The Café Museum was remodelled in the 1930s, but restored to Loos' original design in 2003. It is open all day. Nearest subway is Karlsplatz, at the south end of Kärntner Strasse. Walk west on Friedrichstrasse towards the Secession Building. The café is on the first corner, where Operngasse crosses. For more information please email cafe.museum@vivat.at or call +43 1 586 5202. A practical, readable, affordable guide to Loos houses (including this one) in Vienna and elsewhere, with addresses for visiting. If you like galinsky you should like this guide. Includes an introduction to Loos, and a full reprint of his article Ornament and Crime.